Two Christmases ago we were staying in Bath which is Sue’s home town and it was even colder than it is here now. I found a copy of Dan Leader’s Local Breads and bought it because I can’t pass by bread books. It’s written for beginners but I thought the methods were hopelessly overcomplicated but then bread books either suit you or they don’t. Basically he wanders round Europe in awe of all these master bakers whose traditions fade back into the mists of time. Sadly they always seem to be hiding in the mists of time when I try to buy a loaf in France. 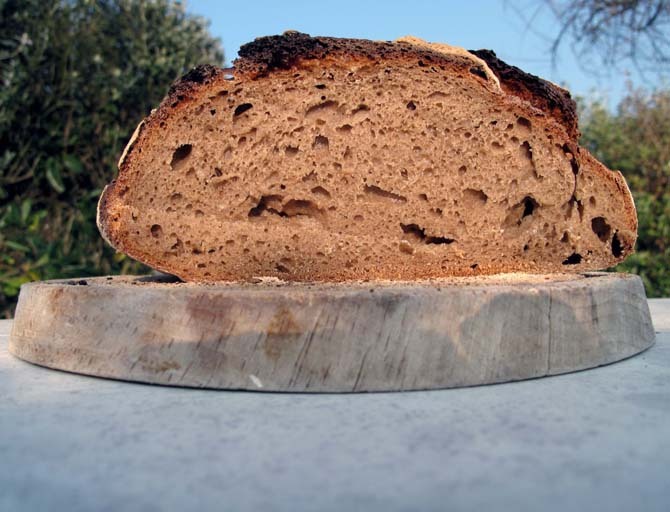 Anyway the one recipe I was interested in was the Seigle d’Auvergne because it had this weird method which involves pouring hot water at 46C over the starter – a temperature which would cause most bakers to worry about the survival of their yeast. Never got round to it. Then, last May, we had a quick week in Nice and the mists of time cleared long enough for us to find an excellent baker at the West End of the Flower Market and, even though it’s nowhere near the Auvergne, he did a fantastic Seigle d’. During the past two years of baking for sale I haven’t really had the energy to try out new recipes except on baking days and then anything has to pretty much fit into the routine of overnight fermentation plus four hours prove the following day. This is more an hour plus an hour plus two hours. So when I came to try it out, even though I realised it wasn’t going to work, I followed the method exactly, ended up with a cannon ball and binned it. 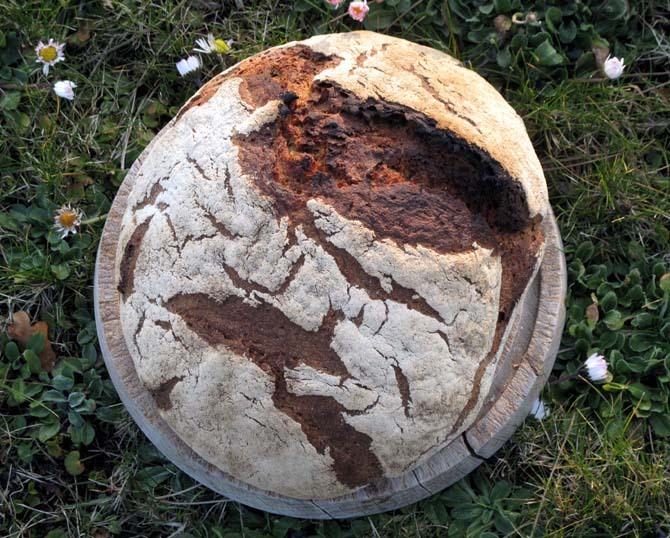 Fortunately, idling through the forum on the Australian sourdough site (www.soughdough.com), I found a post by a guy who styled himself LeadDog who said that the Dan Leader book had a number of errors in it, but he’d actually gone to the trouble to sort out the method. So, top of my list now I’ve got a bit of space in France, was LeadDog’s version of the Seigle d’Auvergne. I had to guess 46C (just a bit uncomfortable for my hand to dangle in) and wet rye is a sod when you’ve only got a soup spoon for mixing and a table knife as a scraper, but I was well pleased with the result. Not a dry eye in the house. And Happy Birthday! – you must be getting on for 40 now. Just to shock you, Big Man, with your love of making focaccia in wooden boxes, a lot of the camembert boxes in France now have cardboard tops and bottoms! Happy belated birthday wishes to BigG too from us! Mick, I have studied Duane’s post, but don’t have a dutch oven, so how do you cook this beast? On a stone, hot oven, cold oven, what did you do in your new kitchen? I’m all set to give it a go as it does look great….. Baked it on Thursday. Still developing flavour and totally wonderful at breakfast this morning (Monday). I proved it as normal in a banneton, turned it out onto a floured baking sheet (cheap and tinny -just like mois) – baked for an hour and cooled in the oven door slightly open & heat off. Please try it Zeb – it’s seriously good. Yes, I’ve googled dutch ovens, they are either very cheap and have three little feet or they are well over a hundred quid. My current casserole dishes don’t have knobs that go over 190 degrees heat, so I’ve never tried the bread in the pot thing that everyone writes about – I have an oven that can get really hot so have never bothered. Did you make the full 2.2 kilo version that he describes and it cooked in an hour? Is that more or less it? I’ve tried the recipe twice because I have that book too. It rather exploded at one part and didn’t do anything on the other end. Twice. What gives? Probably too short rise. But I thought the hot water would hasten things. The flavor was really sharp and aromatic. I’ll do a stripped down version but as you will see somewhere it’s big lunch time in Bordeaux tomorrow. Where you live you can actually go to Nisbets. They do really cheap enameled cast iron stuff – heavy but good. I shall celebrate the day I have anything I have to offer you on the rye front. I’ll write up the way I did it in a couple of days. I’m hoping to have some time to catch up with all you postings in the next few weeks.